"Easy mini hand pies are made of biscuit dough, canned chicken, and frozen vegetables for a simple and savory hand-held snack or appetizer." Preheat the oven to 350 degrees F (175 degrees C). Spray a baking sheet with cooking spray. Pour mixed vegetables into a microwave-safe bowl. Add water. Heat in the microwave until warmed through, 1 to 3 minutes. Drain. Spray a skillet with cooking spray and heat over medium heat. Add onion and cook until soft, about 3 minutes. Add mixed vegetables, diced chicken, condensed soup, salt, and pepper. Cook and stir until filling is heated through, 3 to 5 minutes more. Open biscuits and flatten each circle out with your fingertips. Place a portion of filling on one half of a circle and fold the other half over. Press edges with a fork to seal closed. Place mini pie carefully onto the prepared baking sheet. Repeat with remaining biscuits and filling. Bake in the preheated oven until the outsides are golden, 30 to 35 minutes. 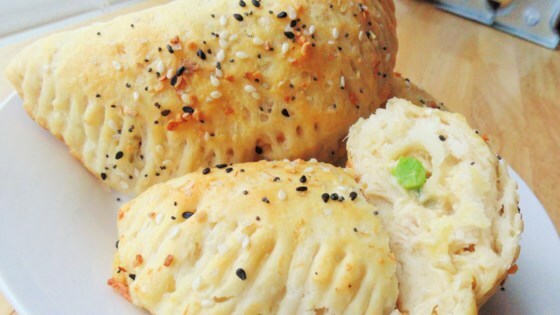 These hand-held pot pies are so easy to make! Use the same amount of freshly cooked chicken in place of canned, if you prefer. Won’t make it again. Too much biscuit for each dollop of filling, plus the filling is definitely not good. I’m thinking it’s probably the cream of chicken that dooms it. I used a rotisserie chicken instead of canned meat and it turned out really well. Really a good way to use left-over / extra roasted chicken. I like the biscuit idea better than other prepared dough items. I like to make these up and freeze (cooked) for later. I used fresh chicken breast instead of the canned chicken. It was delicious! Turn out great, helped my wife in the kitchen with hosting a baby shower.